Life is a bit busy and crazy at the moment (but in a good way - don't worry! 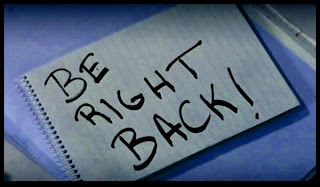 ), so I am taking a month-long break from blogging. I may still post the occasional review during that time, but won't be commenting very much. I plan on returning after our vacation in September. See you then! 1. The last meal I had at a restaurant was Vietnamese pho. 2. Road rage is something I intensely dislike. 3. The full moon is beautiful to behold. 4. Da 'burgh is one of my favorite local expressions from my college days in Pittsburgh. 5. Sometimes it's best to keep your mouth shut. 6. Once is the best movie I've seen so far this year! 7. And as for the weekend, tonight I’m looking forward to Shabbat breakfast at dinner (challah French toast with fruit), tomorrow my plans include going to the park if it doesn't rain and Sunday, I want to finish reading Independent People by Haldor Laxness! You'll have to bear with me these days, our internet connection is intermittent, and until it is fixed I have very little time to update my blog! I have never read any books about the Olympics, or specific Olympians. I have never been particularly interested in reading books about sports, either fiction or non-fiction. With the exception of extreme sports, like rock-climbing, diving, abseiling, or climbing Mt. Everest. However, I do like to watch sports. If we lived in a perfect world, with 100-hour days, I would watch more sporting events, like basketball, ice skating, soccer (futbol), and rugby, to name a few. But we don't, and I have other interests--like reading and cooking, and getting outdoors to hike, bike, or swim--that I enjoy more. I do love to watch tennis' Grand Slam tournaments, since I was a tennis player myself. I love watching both the Summer and Winter Olympics and the World Cup. Sometimes I tune into the Commonwealth Games. I never watch football or cricket, and I only enjoy watching a baseball game in person. 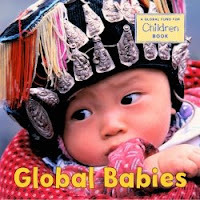 This is a very sweet book that shows pictures of a diverse group of babies from all over the world: Guatemala, Thailand, Greenland, Mali, USA, India, South Africa, Fiji, Peru, Afghanistan, Malawi, Spain, Iraq, Rwanda, and Bhutan. Some of the babies are dressed in bright, colorful traditional dress, others in a simple t-shirt. Some babies are worn by their mothers in a sling or papoose. All our a beautiful illustration of our global illustration. The message of the text is simple but poignant: "Wherever they live, wherever they go, whatever they wear, whatever they feel, babies everywhere are beautiful, special, and loved." It was a perfect book to read at the start of the Beijing Olympics, especially for the 6-12 month age range. First sentence: My planet fetish began, as best I can recall, in third grade, at age eight--right around the time I learned that Earth had siblings in space, just as I had older brothers in high school and college. I am a humanities person through and through. The only aspect of science that has ever held me interest is psychology, and astronomy usually causes my eyes to glaze over. However, when I saw raidergirl's recent review of The Planets, by Dava Sobel, and the book appeared in my library's bookmobile a week later, I knew I had to check it out. Pluto (no longer classified as a planet) is smaller than the moon. 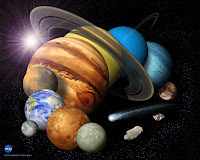 The Planets was published before Pluto was demoted as a planet, but Dava explains the controversy surrounding its planet status, and how its demotion can actually be viewed as a sign of scientific progress in understanding our Solar System. Her book is a great introduction into our amazing and fascinating solar system. "Former President Jimmy Carter, while serving as governor of Georgia, reported Venus to the state police. During World War II, a squadron of B-29 pilots mistook the planet for a Japanese plane and tried to shoot it from the sky." If you have read this book and would like your review mentioned here, just leave me a link in the comment section! It is a mild and refreshing Sunday here in this Saloner's corner of the world. For August, we are having surprisingly low-humidity, moderately warm days. It's wonderful! I considered joining the Olympic Reading Challenge, hosted by Annie, a while back. Ultimately, however, I decided to take a completely different approach to my reading during the Beijing Olympics. Rather than reading American authors, I am reading books by authors in other countries. Yesterday, I started with Independent People by Icelandic author Haldor Laxness, and so far it is turning out to be a wonderful read. Haldor Laxness won the Nobel Prize in 1955, but his books were largely out of print for English readers until Independent People was republished in English in 1997. It is a delight, and a challenge, to read a book that takes place in a country I know very little about. For books first published in languages such as Spanish, French, Arabic, German, Italian, Chinese, or Japanese, I at least recognize some of the places mentioned and usually know how to pronounce the names of the characters. The only thing I know about Iceland is that beautiful fjords follow the coast, the capital is Reykjavik, and fishing is the source of much of its exports. Since Independent People is not set in the capital, or in a fishing village, but in the valleys where sheep farmers reside, everything I read about is a new experience. It is armchair traveling at its best! In the Introduction, Brad Leithauser describes the novel as the book of his life. He describes it as a "book of genius that, even in a long bookworm's life, one might never have stumbled upon." Books that are not on the well-trodded path, "in which the flaws of a book are as endearing--as treasurable--as the flaws in the face of one's sole beloved." Do you have a book of your life? A book that most people would look at you and go, 'huh'? For me, that book would probably be The Handmaid's Tale by Margaret Atwood. Although well-known, it certainly doesn't do the round in the way that Pride and Prejudice, Grapes of Wrath, or the Bible can. Yet when I first read The Handmaid's Tale in a Women's Lit class, it's impact was profound. An idealistic college student, the novel (combined with a few other factors, such as the Cultural Anthropology course I also took that semester) started me on a path that eventually led towards my study abroad experience on Semester at Sea, a Master's in International Relations, and my work with refugees and asylum seekers. How did one little book do so much? Well, that's a story for another time. On an end note, as much as I love watching the Olympics, this year is more important to me than ever. One of my former clients, Abebe Fekadu, will be competing at the Beijing Paralympics in September!!! This amazing man, who has overcome so much, is an inspiration to so many. He is a kind, gentle, and humble soul, and I am honored to know him. Originally from Ethiopia, he will be representing Australia in powerlifting. Although the Paralympics don't begin until September, I am already sending "Go Abebe!" vibes towards Beijing. :) I haven't seen Abebe since my wedding in October 2006, right before we moved back from Australia to the United States, but his journey and success are still close to my heart. Each page features babies of varying ethnicities. It's a cute book, with nice illustrations. There is one glaring inconsistency, however. The book starts with Baby born in the winter. Yet, at the end, when she turns 1, it is spring or summer. It could be a challenge to see at what age Maya notices this difference! 1. You know you're old when when you have to get up 3 times a night to go to the bathroom. Either that or you're pregnaant. 2. My heart is divided between reading What is the What by Dave Eggers and Mary Stewart's Merlin Trilogy. 3. A pot of tea is what I need RIGHT NOW! 4. I have felt the crisp pages of a new book, I have known the depths of the basement that hides the older, funky novels. 5. Gah, won't these people learn how to drive? 6. Eat a pie as soon as you can! 7. And as for the weekend, tonight I’m looking forward to Shabbat dinner, tomorrow my plans include a day trip to NYC and Sunday, I want to have a couple hours to myself! I think it would be a lot of fun to live in the alternate England of Jasper Fforde's Thursday Next series. I would love to be a literary detective, and have that kind of interaction with my favorite books! I would most certainly not want to live in the Republic of Gilead, the world Margaret Atwood created in The Handmaid's Tale. Gilead is a totalitarian state that has replaced the USA, and Offred is a handmaid who has the 'privilege' of sleeping with other women's husband's in an attempt to bear them children. A handmaid is treated as a slave, and if they do not become pregnant, are sent to a concentration camp. What about authors? If you were a character, who would you trust to write your life? (This came to me when reviewing a Jonathan Carroll book - I'm not sure I'd like to live in the world of his books). I would love for Isabel Allende to write my life. I love her writing style, and it would be nice to see my life touched by a spot of magical realism. Oh no! Not my opinion! Last week's absence was unplanned, but I seem to be getting back into the swing of things again. I find that I go through moods where my books (and life!) consume me much more than blogging. I take that as a healthy sign. :) Of course, there's nothing like another attack aimed at book bloggers to get me back to the keyboard! Well, I think book reviews on blogs -- particularly those of the Blogspot variety -- tend to be self-indulgent. Book reviewing bloggers need to move away fromopinion in favor of judgment. How does the book compare to -- and fit in with -- the author's previous work? What's the book's place in the genre? The canon? Does the writer succeed in doing what he or she set out to do -- meaning, is it the book they meant it to be? Whether it's the book the blogger wanted it to be is of much less importance to me, frankly. Her complaint is exactly what she rails against...her opinion. And opinion is main reason I read blogs. I want to know what other people think about a book. I like to discuss the novel I just read with others, I find the personal interaction stimulating. In my opinion, I am glad that many bloggers generally stay away from some of the above topics. If I want to know how a book fits in with its genre or canon, I'll go to a book or magazine of literary analysis and criticism. But that's not what I'm looking for here. 1. It's a hobby that I really enjoy. 2. I find it adds another level to my reading, and I now tend to retain more from the books I read. 3. I love reading the opinions of other bloggers who have read the same books. 4. I love discovering new books through other bloggers reviews and discussions. 5. I find the book blog community contains a wonderful group of very interesting, intelligent, kind people! It's great to be a small cog in this little world. I do not blog because I want to be a professional book reviewer. I do not want to upstage newspaper book reviewers. There are quite a few other wonderful comments out there in reaction to this article. Check out book-a-rama, caribousmom, minds alive on the shelves for further discussion. I have also been tagged by seachanges for the six quirky things about me meme. 1. I am very particular about how I drink my tea. Some I drink with milk and sugar (ceylon, chai). others with honey (lemon tea, chamomile), and still others with no additions (most herbal teas, green tea, and white tea). With the exception of black teas, almost all my tea is loose leaf. 2. I almost always only read one book at a time. 3. I have a weakness for gossip blogs like pink is the new blog which completely contradicts my personality. 4. I spend most mornings going on mini-hikes or bike rides with my daughter. 5. I rarely watch tv, sticking mainly to an occasional The Daily Show and Lost. The rare times I turn on the tv randomly, I have a strange addiction to Law & Order and CSI (the Las Vegas version only). 6. One of my favorite hobbies which I rarely get to indulge at the moment is traveling to other countries. Because Maya is almost out of patient, instead of tagging six people, everyone reading this can consider themselves tagged! And finally, I've realized that I am quickly finishing quite a few of the challenges I signed up for this year (with a few I have failed miserably and all but given up on). So, I am looking for some new ones. I have ignored almost all new challenge posts over recent months, so I don't know what's currently out there. So, in your opinion, what are some of the most exciting challenges that have just started, or will start in the next month or so? Challenge Blog: What's in a Name? Favorite: It would be a toss-up between The Bluest Eye by Toni Morrison and Tears of the Giraffe by Alexander McCall Smith. Least Favorite: Definitely The News from Paraguay. I wouldn't recommend this book to anyone. New-to-me authors: Lily Tuck, Lisa See, and Louise Erdrich were all new to me. First sentence: For him it began with a feather. The News From Paraguay chronicles the relationship between Francisco Solano, the future President and dictator from Paraguay, and the Irish courtesan Ella Lynch, who follows Francisco back to Paraguay, bearing and raising his children. The story is set amidst a backdrop of war and violence as Francisco, as President, declares war on virtually all the countries surrounding Paraguay. There is not much to like about this book other than the first sentence. The story is disjointed, and jumps from character to character, never fully explaining anyone or anything. As historical fiction, it never gave me the feeling that the author really understood the time period and country she was talking about; the exploration into Paraguay's War of the Triple Alliance and its relationship with other South American countries, England, and the United States was superficial at best. Most of the scenes were almost immediately forgettable. I am amazed it won an award. If you have read this book and would like your review listed here, just leave a comment with the link to your review!